Broken up in September 1821. 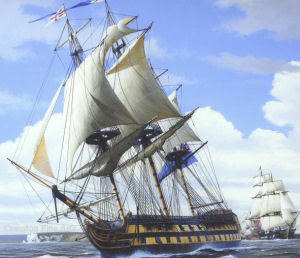 Nelson served in her as a Rear-Admiral from March 1798 - June 1799. His Captains were Edward Berry, from December 1797 - August 1798; and Thomas Hardy, from August 1798 - June 1799. I could not find a picture of this ship. Conveyed Vice-Admiral Nelson as Commander-in-Chief to the Mediterranean from May - July 1803, with Captain Thomas Hardy. The fourth ship to bear the name HMS Superb was a 74-gun third-rate launched on 17th March 1798 from Northfleet. In 1801 she captured the Nancy and the Audacieux (both with HMS Venerable and HMS Cambrian). In 1813 she captured the American schooner Young Holkar and brig the Starr as well as the schooner Viper and Magdalea. She was broken up in 1826. HMS Fairy was a 14 gun ship-sloop of the Swan Class and was built at the Royal Dockyard, Sheerness.